Jeffrey A. Griswold is a 1976 graduate with distinction of the University of Colorado at Boulder. He earned his J.D. from the Georgetown University Law Center in 1979. He is licensed to practice in Hawaii and the District of Columbia and has served as past president of the Hawaii Chapter of the Federal Bar Association. Mr. Griswold began his legal career as a Captain in the Army Judge Advocate General’s Corps which allowed him to gain valuable courtroom experience. 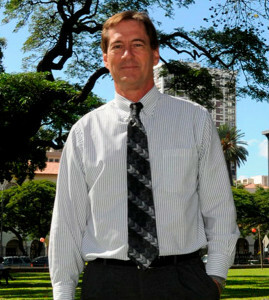 He has been in private practice with Lyons, Brandt, Cook & Hiramatsu since 1983 and a partner since 1988. His practice is focused primarily on the litigation of commercial and insurance disputes involving professional liability, construction, real estate and government contracts. Mr. Griswold has successfully litigated numerous cases to verdict in jury, nonjury and arbitration proceedings. He also regularly serves as an arbitrator and mediator in alternative dispute resolution proceedings. In addition to being a busy attorney and the proud father of two boys, Mr. Griswold has also received recognition for his furniture making skills. He has won several of awards at the annual Hawaii’s Woodshow and has been commissioned to reproduce furniture for the Iolani Palace.